Buchanan's Forever is pleased to welcome Sting for performances on May 4, 6, and 8, 2010, in Caracas, Bogota and Mexico City, respectively. Sting is the latest addition to the roster of talent who have joined Buchanan's Forever over the past three years and graced the stage in the name of social responsibility. Artists are chosen to perform with Buchanan's Forever on the basis of their iconic status, history of philanthropic endeavours and willingness to support Diageo's philanthropic platform LEARNING FOR LIFE, which provides educational tools and life skills to thousands of individuals throughout Latin America & the Caribbean. 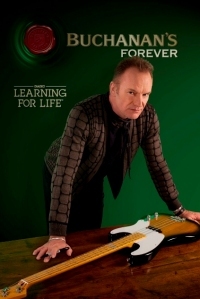 "I am pleased to be performing with Buchanan's Forever in support of Learning for Life" said Sting. "Education is really at the heart of improving societies large and small and ultimately the world. I congratulate Diageo for creating this initiative and hope these concerts help raise much needed funds for individuals throughout Latin America." Sting returns to Mexico for Buchanan's Forever after having played there three-years ago and to Venezuela following a performance over nine-years ago; moreover, it will be the first time that Sting performs in Colombia. An artist with a career that spans more than three decades, Sting has received 16 Grammy Awards, an Emmy and Golden Globe award, as well as three Academy Award nominations. Prior to his solo career, he was the principal songwriter, lead singer and bassist for the rock band, The Police. He is a member of both the Rock and Roll Hall of Fame and the Songwriters Hall of Fame. He has also been committed to several causes over the years through various organizations including Amnesty International, Elton John AIDS Foundation, and The Rainforest Foundation, which he founded with his wife in 1989 to protect indigenous people and traditional populations of the world's rainforests. His latest performances in Latin America were with The Police in 2007 and in Brazil in 2009. "Sting is an amazing artist and person whose presence will undoubtedly perpetuate the musical legacy we have created through Buchanan's Forever and enable us to reach our goal of raising 1 million dollars this year for Learning for Life," said Jose Moreno, Vice President for Scotch Whisky, Diageo Latin America & the Caribbean. "For this next edition of the campaign, funds will be raised through several means including tickets sales, product purchase, and on-site silent auctions." Previous Buchanan's Forever artists have included Elton John, James Blunt, Jon Bon Jovi, Fonseca, Fito Paez, Alek Syntek, Gerry Weil and Franco de Vita. Sting will share the bill this year with legendary Latin artists who are joining Buchanan's Forever not only as performers, but as the programs' Learning for Life Ambassadors to help raise awareness and funds for the philanthropic platform. For more information on Buchanan's Forever, please visit www.buchanansforever.com. You can also interact with us via Facebook on the "Buchanan's Forever" fan page, and on Twitter at twitter.com/buchanans4ever. Buchanan's Forever, a unique, intimate musical experience, honours the legacy of Buchanan's founder, James Buchanan, by way of an ongoing community enrichment program which forms part of DIAGEO's regional social responsibility platform, Learning for Life. Buchanan's Forever will be held this year in Venezuela, Colombia and Mexico and in each country will support a charitable project that will directly impact each of these communities. Buchanan's is a premium whisky brand first introduced in 1897, with a portfolio featuring three award-winning whiskies - BUCHANAN'S De Luxe, BUCHANAN'S Special Reserve and BUCHANAN'S Red Seal. The BUCHANAN'S whisky portfolio represents a range of unique and finely-crafted premium whiskies perfectly blended to suit every occasion, and which share a remarkable 110-year history and a commitment to quality. In 1898, James Buchanan was given the Royal warrant to supply the royal household with Buchanan's Whisky starting with Queen Victoria and the Prince of Wales in 1898. In Latin America, BUCHANAN'S De Luxe 12 year old is the best-selling premium 12-year whisky. DIAGEO (Dee-AH-Gee-O) is the world's leading premium drinks business with an outstanding collection of beverage alcohol brands across spirits, wine and beer. These brands include, in addition to Buchanan's, Johnnie Walker, Old Parr, Guinness, Smirnoff, J&B, Baileys, Tanqueray, Red Stripe, Zacapa, Pampero and Navarro Correas wine. Diageo is a global company, trading in some 180 countries around the world. The company is listed on both the New York Stock Exchange (DEO) and the London Stock Exchange (DGE). For more information about Diageo, its people, brands, and performance, visit us at http://www.diageo.com.